Many Aikenites are concerned about the possibility of a public health emergency such as a natural disaster, act of terrorism, or disease outbreak. You can take steps now to help you prepare for an emergency and cope if an emergency happens. To help you prepare, we’ve compiled a list of local, state, and national information resources that you can learn from beforehand to protect yourself and your loved ones. The National Weather Service is a component of the National Oceanic and Atmospheric Administration (NOAA). NOAA is an Operating Unit of the U.S. Department of Commerce. The NWS provides weather, water, and climate data, forecasts and warnings for the protection of life and property and enhancement of the national economy. The CDCs Office of Public Health Preparedness and Response (PHPR) is committed to strengthening the nation’s health security by saving lives and protecting against public health threats, whether at home or abroad, natural or man-made. The South Carolina Emergency Management Division, a division of the Adjutant General’s Office, is the coordinating agency responsible for the statewide emergency management program. SCEMD’s mission is to develop, coordinate, and lead the state emergency management program, enabling effective preparation for, response to and recovery from emergencies and disasters in order to save lives, reduce human suffering and minimize property loss. The Aiken County Emergency Management Division coordinates the county’s integrated emergency management system through partnerships with all emergency response organizations, voluntary agencies, private non profit organizations and other support services, to ensure efficient preparation for, effective response to, and timely recovery from emergencies and disasters to reduce human suffering and property loss. When disaster happens, 2-1-1 is here for you. Trained and certified Call Specialists are standing by to help at no charge to callers. 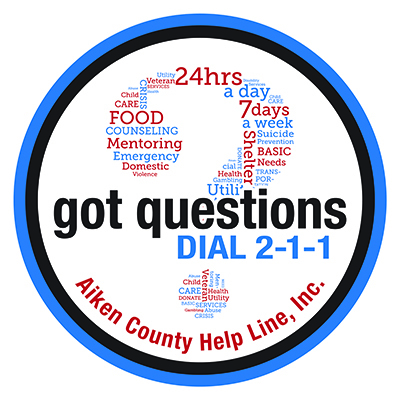 Aiken County Help Line 2-1-1 links callers with help and information during disasters. Help Line shares updated information on evacuation zones, shelters, food, service hours, clothing, and assistance with basic needs. We also provide listening support to victims experiencing distress. The CodeRED emergency alerty system delivers real-time emergency, community, missing person and severe weather alerts to users within the exact area of impact. Alerts are initiated by public safety officials who use the CodeRED community notification system to effectively alert and inform residents to save lives. The following radio and television stations are key participants in the Emergency Alert System and the SC ETV Radio Network. They broadcast emergency information throughout the state, as do numerous other radio and television stations.